Upholster seats and backs with new material for an extended life. Use of laminate that will create a new look for all wooden seating. Use of a new sandblasting and powder coating technique that results in an improved appearance on all metal parts. Manufacture new parts to replace any worn out parts. 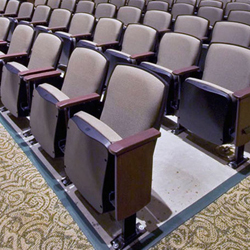 Remove existing seating and install refurbished seating on site, as required by customer. The attention to detail and professional appearance of this work will be a most welcome addition to any school, courthouse or state agency.